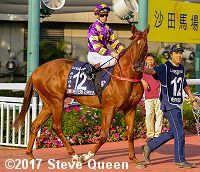 In the HK$23 million (US$3 million) Longines Hong Kong Mile (G1), the world's richest turf mile race, a field of 14 older horses went to post for the 1600 meter (about 1 mile) trip around one turn of the Sha Tin turf. Celebration Cup (G3) runner-up and Jockey Club Mile (G2) winner Seasons Bloom was sent off as the 8-5 favorite in the full field of 14. 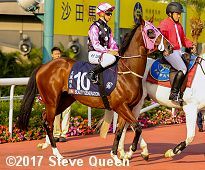 In to challenge him included 3-1 second choice and defending champion Beauty Only, winless since then and 4th in the Jockey Club Mile (G2) last out, and 5-1 third choice Helene Paragon, last year's runner-up and also 2nd in the Jockey Club Mile. Jockey Derek Leung sent 7-1 Beauty Generation to the lead soon after the start and he set fractions of 24.38, 47.45, and 1:11.01 over the good going while pressed by House of Fortune and stalked by 23-1 Contentment and 128-1 Karar. Turning for home, Beauty Generation continued to lead. Western Express, 5th early under Sam Clipperton, put in a strong rally but Beauty Generation held him off by a length for the gate-to-wire win in 1:33.72. It was another 1/4 length back to late-running 6-1 Helene Paragon third, and another 1 1/4 lengths to deep closing 8-5 favorite Seasons Bloom fourth. Left: Beauty Generation in the winner's circle. Winning jockey Derek Leung said, "The plan was always to go forward, be in the first two and lead if that's how it turned out. Everything did go very smoothly with a soft lead and I pressed the button at the 450 (meters) because I knew he would not stop and he didn't. I had no worries to kick for home early and the horse ran so well." 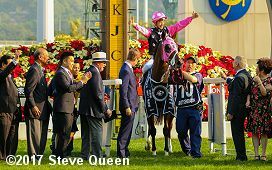 Right: Jockey Derek Leung celebrates aboard Beauty Generation after the race. 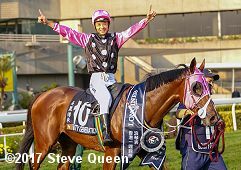 Leung, celebrating his first Group 1 win, is only the second Hong Kong Apprentice Jockey School graduate to win an International Race. Leung added, "I'm very, very happy. I want to thank everyone for their support, especially to the owner (Patrick Kwok) and to trainer John Moore. I was given an opportunity and I took advantage of it. I am always trying to prove myself and I am hoping there will be more international winners in the future. Left: Beauty Generation heads out to the track before the race. Winning trainer John Moore said the win was "no surprise" to the stable. "He's done everything right from day one, this horse. We saw he was a little hampered in the run last time but today he had the gun run and was able to dictate the terms of the race which always looked a possibility. We tried him over more ground last season and he ran well but he starts to grind a bit at the longer trips. We put some speed into him and he has a turn-of-foot at the mile. He's run so well today." Right: All the connections and officials pose with the trophy and winner's banner after the trophy presentation for the Hong Kong Mile. 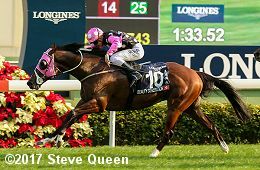 Hong Kong Jockey Club CEO Winfried Engelbrecht-Bresges said, "Derek Leung's win was tremendous � he rode a perfect race. 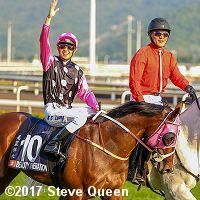 We have invested in our Apprentice Jockeys' School in the last 10 to 15 years and it's great to see a local Hong Kong talent hold his own in international company � the reaction from the crowd was fantastic." Left: Second place finisher Western Express heads out to the track before the race. Jockey Sam Clipperton said, "A gallant effort. He jumped really well today which was the key and I was able to get a good position. He fought hard to the line � the winner is in great form � and I am very proud of my horse. Well done to Derek Leung." 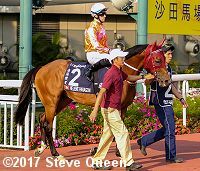 Right: Third place finisher Helene Paragon heads out to the track before the race. Jockey Tommy Berry said, "He jumped better today but I would still have liked to be a bit closer. But he just does not have the speed to put himself there � the winner got a bit of an easy time around the corner which did not help my cause but he has run out of his skin again."